Mr. Knox was carried off the field after his Seahawks defeated Miami in a playoff game in 1983. NEW YORK — Chuck Knox, a three-time NFL coach of the year who believed so strongly in the running game that he earned the nickname Ground Chuck, but who persuaded the New York Jets to take the pass-throwing Joe Namath in the draft, died Saturday. He was 86. His death was announced by the Seattle Seahawks, who said he had dementia. The team did not say where he died. A head coach in the NFL for 22 seasons, Mr. Knox never had a Super Bowl team, but he rebuilt three lackluster teams — the Los Angeles Rams, the Buffalo Bills, and the Seattle Seahawks — into playoff squads, taking them to a total of seven division championships. When he retired in 1995 with a career coaching record of 186-147-1 in the regular season, he was No. 6 in victories among all NFL coaches, behind Don Shula, George Halas, Tom Landry, Curly Lambeau, and Chuck Noll. Mr. Knox was convinced that strong running games produced winners. He groomed several running backs, including Lawrence McCutcheon with the Rams, Joe Cribbs with the Bills, and Curt Warner with the Seahawks. “If Chuck had his wish, it’d be 3 yards and a cloud of dust and he’d win, 7-6,” Steve Largent, his star receiver with the Seahawks, once said. Apart from his conservative inclinations on offense, Mr. Knox preached discipline and hard work on the football field, the qualities he displayed as a rugged lineman at Juniata College of Huntingdon, Pa., having come out of a steel town where his hard-drinking father worked in the mills and wanted him to do the same. While a line coach with the Jets in November 1964, Mr. Knox lobbied their owner, David “Sonny” Werblin, and the head coach, Weeb Ewbank, to take quarterback Joe Namath as the American Football League’s No. 1 draft pick, despite his knee problems at the University of Alabama. Mr. Knox built an outstanding offensive line with the Jets, led by Winston Hill and Sherman Plunkett at the tackles. “They knew Joe Namath was going to make the difference, and we had to be able to protect him,” he recalled. But Mr. Knox became an assistant coach with the Detroit Lions in 1967, missing out on Namath’s engineering of the Jets’ stunning Super Bowl triumph over the Baltimore Colts in 1969. Charles Robert Knox was born on April 27, 1932, in Sewickley, Pa., an industrial town near Pittsburgh. After playing tackle at Juniata and graduating with a degree in history, he coached at Pennsylvania high schools and then became an assistant at Wake Forest and Kentucky before being hired by the Jets in 1963. After four seasons with the Jets and six as an assistant coach with the Lions, Mr. Knox replaced Tommy Prothro as coach of the Rams in 1973, taking over a team that had gone 6-7-1 the previous season. Mr. Knox coached the ’73 Rams to a 12-2 regular-season record and had five consecutive National Football Conference West championship teams in Los Angeles, doing it with five quarterbacks — John Hadl, James Harris, Ron Jaworski, Pat Haden, and Namath at the end of his career. But his Rams were beaten in the NFC Championship game three consecutive times — by the Minnesota Vikings after the 1974 season, then by the Dallas Cowboys and then the Vikings again. 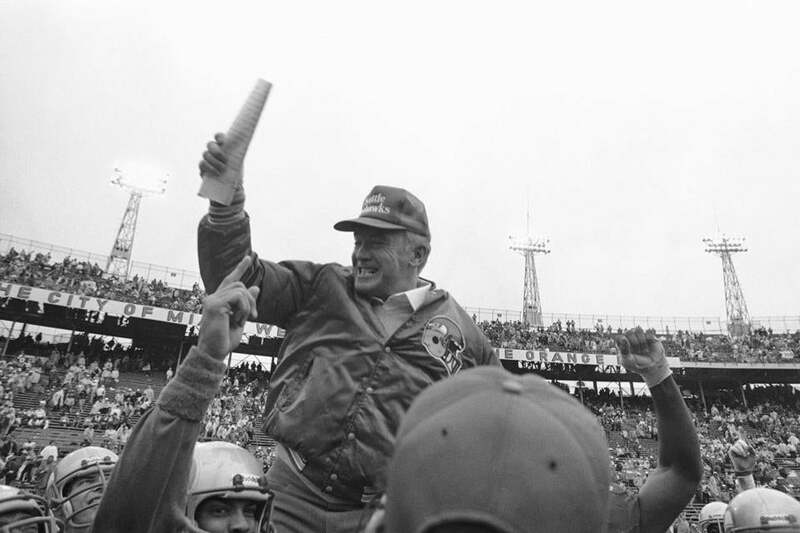 Mr. Knox became the Bills’ head coach in 1978, when they were coming off two losing seasons. He traded O.J. Simpson, who was beginning to decline, developed a running attack behind Cribbs, and took the Bills to the AFC East title in 1980 and a wild-card playoff spot the following season. He was named head coach of the Seattle Seahawks in 1983, the franchise’s eighth season, and coached them to their first postseason appearance, as a wild-card team, taking them to the AFC Championship game, a loss to the Oakland Raiders. His Seahawks made the playoffs three more times and won the AFC West title in 1988. Mr. Knox returned to the Rams in 1992, but they finished last in the NFC West for three straight seasons and he was fired. He then retired. Mr. Knox leaves his wife, Shirley. A complete list of survivors was not immediately available. Mr. Knox was never particularly quotable, but he did have a list of aphorisms, which came to be called Knoxisms, reflecting his approach to life, and he conveyed them to his players. Dave Krieg, who played quarterback for Mr. Knox with the Seahawks, recorded the Knoxisms in a notebook. “Chuck’s overall presence, his intensity, his toughness, play a big factor in helping us win,” Krieg once told Sports Illustrated.